Tagged under Michiaki Watanabe, Studio DEEN, Series. Once upon a time in a medieval world of music, lived a woman called Pandora. She opened a magical box in which all the evils of the world were contained. Once unleashed they swept out across the world as monsters, terrorizing the peaceful humans who lived in it. 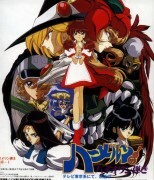 As the people pray for a hero to appear and save them all, a young musician who wields a giant violin and travels in the company of a talking crow appears. With his magical music Hamel defeats monster after monster while on a mysterious quest to the North. Along the way he is joined by several companions, including Flute - a girl he took as reward after saving a village, Raiel - his childhood friend who carries a golden piano and Trom Bone - a young prince whose land was destroyed by the Mazakou. Awesome, hilarious manga, absolutely crap-tastic anime. The manga's good because it tries to be funny and definitely succeeds, but also manages to have several genuinely heartwarming moments and a serious, involving plot, as well as very good characters. The anime is good because it takes all of the manga's humor and throws it out the window and has the smallest budget in the history of anime, resulting in something so unintentionally hilarious it's worth watching just to laugh at it while it tries and fails epically at being good. The anime and manga are both personal favorites of mine, for totally different reasons. 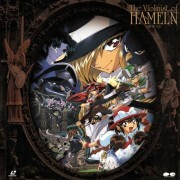 No feedback on Violinist of Hameln.